I’ll be honest, I am excited for school to start back up. By the end of summer my kids all need a break from each other, and I am ready to get them back into the classroom and off of the couch. But what I usually am not looking forward to is packing those school lunches everyday. In the past I have fallen victim to the ‘oh-so-easy’ PB&J. My kids got pretty sick of those each and every school day. So, I had to branch out and think of new things to pack in those lunch boxes. 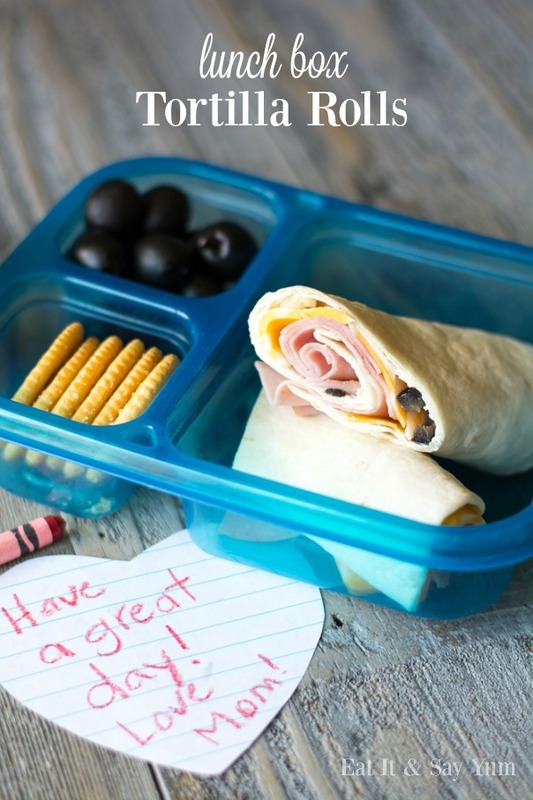 So, I modified one of my favorite appetizer recipes and made these fun, lunch box tortilla rolls. My kids love these. I can customize them to my kiddos tastes, and they are easy to make. Plus these are a different shape than sandwiches, and apparently that means something to kids! 😉 This basic version has cream cheese spread onto a tortilla, and is topped with sliced black olives, green onions, cheese, and lunch meat. But every once in awhile, we even do our PB&J like this, all rolled up in the tortilla. A little variety can be a nice thing. Some other toppings I suggest, if you think your kiddo will eat them, are: sliced cucumbers, sliced tomatoes, salt and pepper, lettuce, sprouts, nuts, dried berries, etc. The options are really limitless. Do you think your kids would love these? Mine sure do! So, break out of the sandwich rut and try something fun and different! sliced (or grated) cheese- cheddar, colby jack, pepper jack, etc. lunch meat- ham, turkey, roast beef, etc. Optional: cucumber slices, tomato slices, nuts, dried fruit, sprouts, etc. Spread cream cheese on one side of the tortilla (how ever many you need), sprinkle the sliced olives and green onions over the cream cheese. 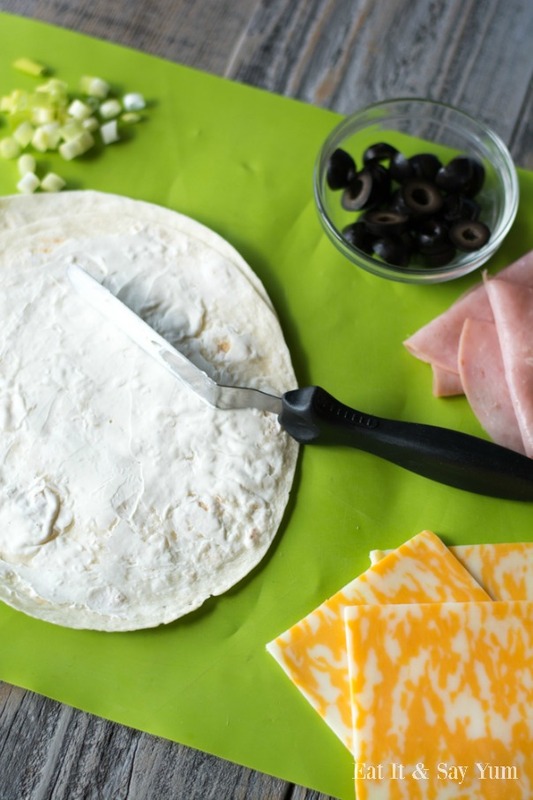 Layer two slices of cheese along the center of the tortilla, top with 2-3 slices of lunch meat. Add any of the other optional toppings if you choose. If you make these the night before, store them in the fridge until the next morning. They will be fine not chilled in a lunch box during the school day.